Wingsy is nearly all white except for a tiny patch over one eye and spots on both ears. She was a very valuable, high dollar, greyhound with great breeding from a very successful racing litter. She was retired young to produce more pups like her and sold at auction for $22,000. She had a litter of 7 pups in 2006 but had some problems having another litter this year so will not be able to have any more pups. She was retired from the brood farm as soon as her one surviving pup was old enough to leave his mom. Now she is ready to be a pet. She is still a young girl at only 4 years old. 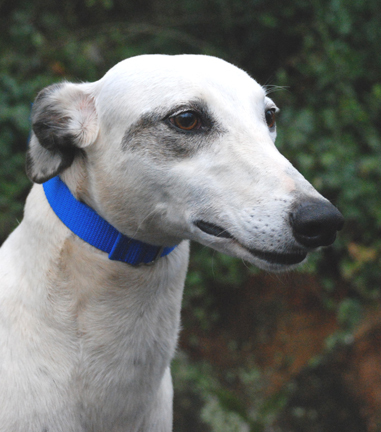 Wingsy is friendly, sweet, happy and like many dogs that have raised pups seems to be wise beyond her years. She seems to get along with other dogs, male and female of all sizes but like most former mama dogs is likely to to try to keep other dogs in her home in line. She potties well on leash and is quiet in her crate so may be OK in an apartment or townhouse. She loves to go for rides and travels well. She is going to make a great pet. Wingsy was adopted and renamed Wendy. When her last pup retired he went to live at her house. She lived a long life and passed away at 12.5 years old due to Lymphoma.